Convert videos in other formats to AVI and offer a powerful merging function. Free utility downloads from the best in download catalogues! Use the featured software apps sections, check the most recent renews of the popular softwares, and setup for free! Do not toss away an option to try the best computer software: apply SoftEmpire website to try computer software for free. Check out the directory of freeware and software tool demo versions. Choose among OS utilities programs, download managers, antiviruses, and all other sorts of apps for your computer or mobile stuff! - Automatically splits long Wave files into tracks, completely customizable, easy to use. - Great tool for transferring records and tapes to CD- it can separate a single long recording into individual songs. - Excellent for splitting long speeches into segments. - Can merge split tracks and save them either in Wave or MP3 formats. - Integrates completely and easily with RipEditBurn for editing and burning audio CDs. 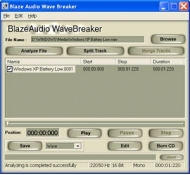 Wave Breaker is an ideal program to use with our powerful Wave editor, and CD Burner RipEditBurn. Blaze Audio offers lifetime free upgrades and free technical support to purchasers. The program also carries a generous 30-day money-back policy. Come visit our extensive on-line tutorials and discussion groups- Blaze Audio is a lot more than just our products! Convert between all audio file types easily from one format to another with all possible settings. convert (from &amp; to) WAV PCM, MP3,WMA, ALF2, ADPCM, GSM, G.726, DSP, A-LAW, ACM, U-LAW, PCM, Ogg Vorbis, CDA files. RM To MP3 Converter is a super and ease-to-use audio converter. It directly converts audio from RM to MP3 format. By the ID3 Editor built in you can edit the ID3 information for your converted MP3 files.